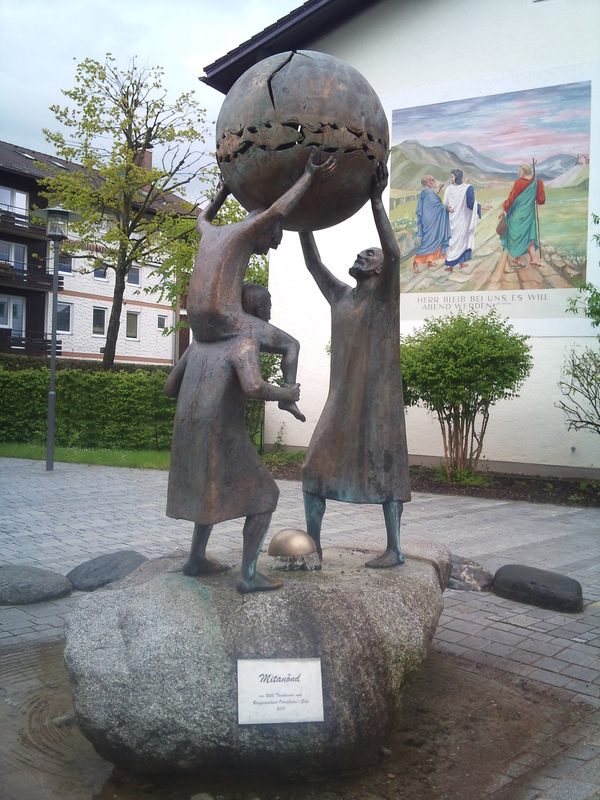 15 – 18th May 2014 ….. To get there from our start point, Plzen, a scenic train trip through Cheb, Nurnberg, Buchloe and Kempten … attractive towns and cities, but none that quite matched the beauty and friendliness of our destination, Sonthofen, with Emilly as our wonderful host. We could sense as soon as we met – Love is in the Air. 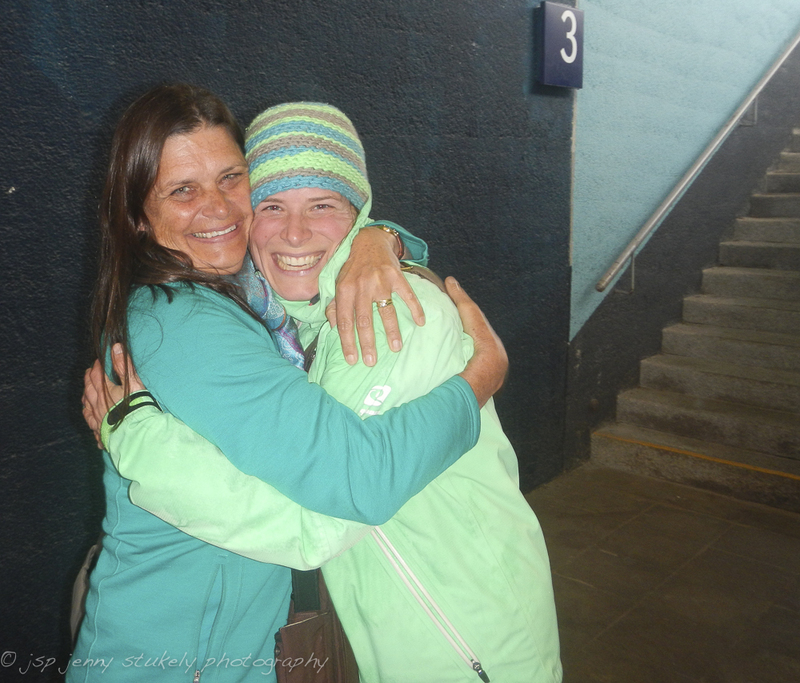 Em met us at the station, tears streamed after long hugs (this is Em with Jenny, not Jack); it was really nice to see her after some years ago when she stayed with us in Oz. And yes – a man Jack (Yurgen) has entered her life. 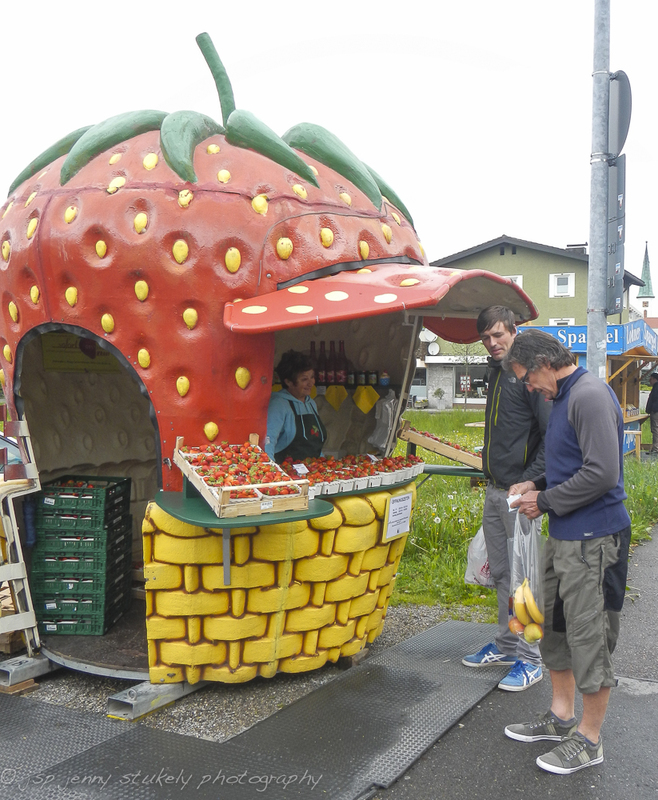 Sonthofen is beautiful, at the foot of the Alps not far from Austria, Bavarian as Bavaria can be, icey streams, cobbled walkways through the town, scrumptious markets (this is Jack & I at the strawberry stall – you wouldn’t have guessed this would you?) and picturebook mountainous landscape. Add this to a modern town with rich cultural and strong economic foundations, it was an unforgetable visit. The town has great shopping for shoes and sports apparel. We were a tad short of both so it was timely. The guys at the bike shop were also most helpful, providing the best cycles we managed to get in 7 weeks of many hirings. Amongst the many unique festivals one is the Egga-Play. Culturally illustrating the importance of agriculture, it symbolizes the struggle of the people with the elements of nature. 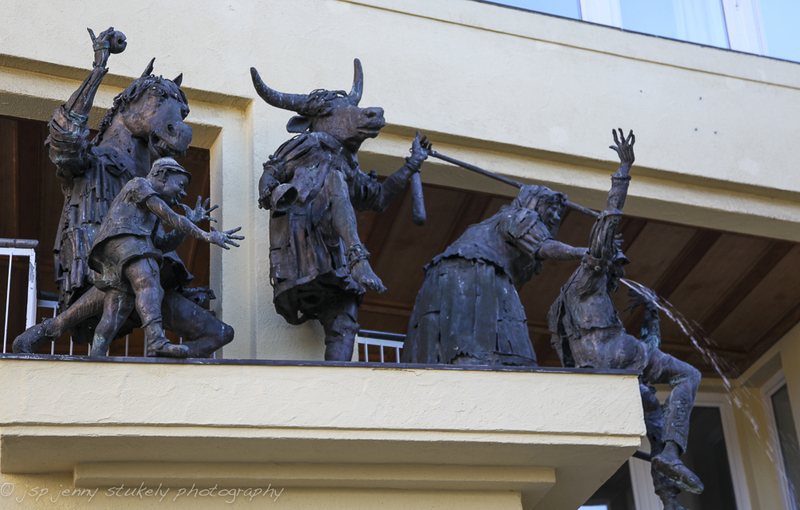 The actors all have large carved wooden masks and figures represent the following: farmer and his wife, son, daughter, servant, maid, horse, cow, cat, dog, pig, rooster and billy goat. The game starts with a parade of the participants through the city to the market place before it ends before its hall. Transformed into a farm with a field, the farmer, the farmer’s wife, servant and maid start tilling the field. But there comes the “witch” in between and mixes all up. It makes the cattle shy and spoil the food. Finally, a big witch hunt begins on until the witch is captured and imprisoned. It is a thoughtful town. The public art illustrates its concern for the world, the strength of religion and also the artfulness in underwear! 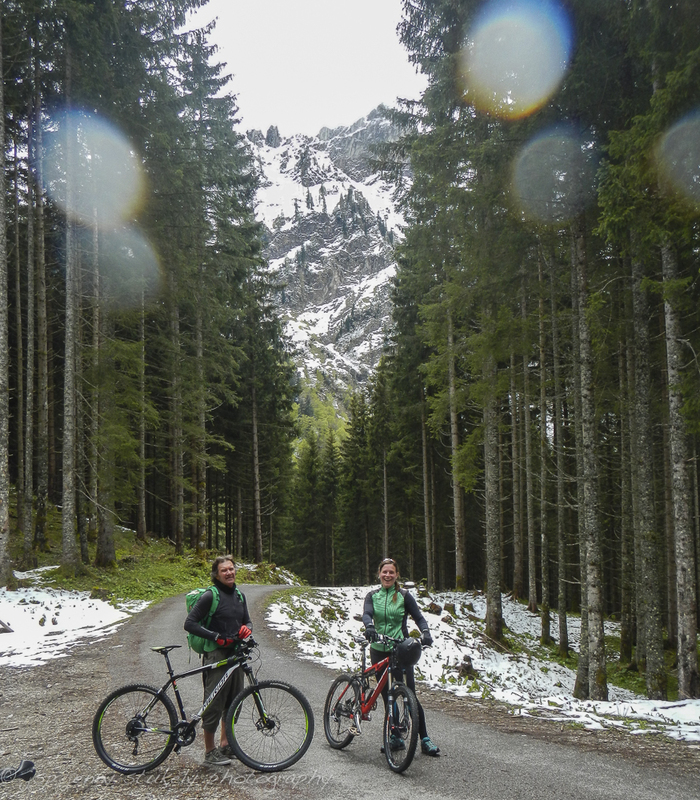 The beauty though is massively enhanced by the backdrop of mountains and that clean, crisp, fresh air (Em and I on mountain bikes). On the way we came upon the most amazing collection of sculptures and collectables. It is on the way up the mountain from town, a collection of so much it is impossible to describe – he has created a world of how things were, might be, are. A couple of photos does no justice, a book would do no justice!